Junior Minister of Health Hon. Hazel Brandy-Williams with Hospital Administrator Gary Pemberton, Philips representative Richard Souter, radiographers Karema David and Glenford Herbert, Permanent Secretary in the Ministry of Health Shelisa Martin-Clarke and radiographer Rolman Yedra at the commissioning ceremony of a new Philips Affiniti Ultrasound system (centre) at the Alexandra Hospital on March 14, 2019. NIA CHARLESTOWN NEVIS (March 18, 2019) — The Nevis Island Administration continues to make strides to provide better health care on the island of Nevis. 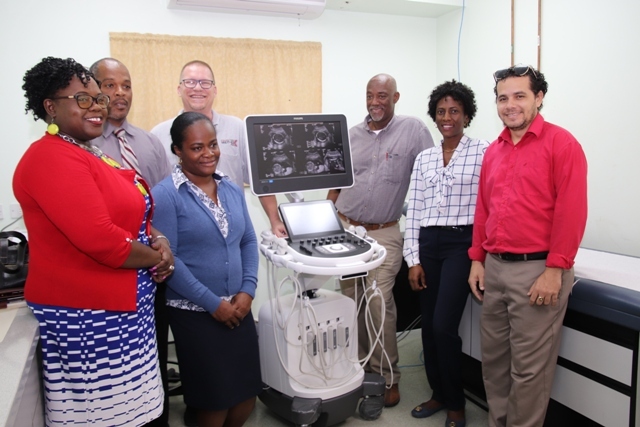 On March 14, 2019, a brand new Philips Affiniti 50 Ultrasound system was commissioned at the Alexandra Hospital. 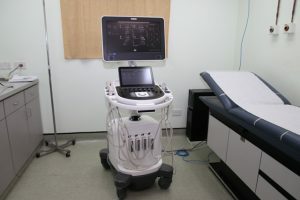 The ultrasound machine was commissioned by Junior Minister of Health in the Nevis Island Administration Hon. Hazel Brandy-Williams. In remarks, Hon. Hazel Brandy-Williams expressed that the ultra sound system came at an opportune time and also that the system is a significant investment towards improving the health system. “This machine has come at a timely venture when we would have experienced some difficulties doing our ultrasounds. I am indeed very happy that the technician would have explained that this bit of equipment is forward looking. It can do most of the tests that we are doing now and it has capabilities for future tests that will come on-stream…It means then that we at Alexandra are remaining current and we are even more forward looking than ever before. I want to place on record that this is a major investment placed by our administration in terms of improving the services here at Alexandra,” she said. She also referred to the commissioning as a proud moment for the administration especially the Ministry of Health. Hospital Administrator Gary Pemberton explained difficulties faced with the prior machine. “We decided to purchase this new machine because last year we would have experienced challenges with the previous machine which was down for a couple days, which means that there was a break in the service that we were providing at the hospital… We have two machines that should be operational. So moving forward there should not be a break in the service that we are providing here at the hospital,” he said. Also present were Acting Permanent Secretary in the Ministry of Health Shelisa Martin-Clarke, Philips representative Richard Soutar and radiographer Glenford Herbert, Karema David and Rolman Yedra.